Well...to be fair they did want to make Red and Blue a very big pair of games. But, hardware space was limited on the Game Boy cartridges so a lot of ideas (a lot of Pokemon, Breeding, Female playable characters) had to be fall onto the cutting room floor and saved for the second Generation of Pokemon games. Okay; the next post for Alpha and Beta Secrets deals with Pokemon Platinum and Pokemon HeartGold and SoulSilver versions together; since they are both pretty small. Garchomp was to have a different sprite then was in the final product; one that shows it lunging forward. The Battle Park went unused in Pokemon Platinum. The Battle Park gate was replaced with the Frontier Gates, but all the static NPCs were not moved. The event where you'd meet Palmer was still there as well as the Razor Fang item. There were 9 unused maps of the Distortion World. The only thing different about these maps was they did not use the special camera angle that is present in the final product within the Distortion World. Unused sprites exist for Shaymin (Land Forme), Giratina (both Alternate and Origin Forme) as well as appliance images for the different Rotom forms. Unused music from Diamond and Pearl exist with the Platinum files and the Point Card and the Galactic Warehouse Key are unused items. The Point Card, however does has some form of purpose if it is hacked into a copy of Platinum; despite the fact Frontier Points were calculated from the V.S. Recorder. If the Galactic Warehouse Key was to be hacked in; it would not have any use. There are also leftover debugging tools within Platnium's files; like "Sound Test" and an option to modify the in-game clock. Here are beta images of Gold/Ethan and the rival Silver. Ethan's/Gold's cap has a red symbol on his hat and his hair was slightly different. Silver is seen sporting an all dark gray outfit. Chikorita's leaf is darker here then what was in the final product. There is also an image for a shiny version of the Spiky Eared Pichu; despite it having a fixed Personality Value and thus was unable to be shiny. Here are some more beta images. The first one shows the beta Ethan/Gold and Silver sprites and the unfinished battle screen. The second image is in the Slowpoke Well. Where Rocket Admin Proton is located; is a regular Rocket Grunt. This is probably leftover data from Gold/Silver/Crystal where Proton was a Rocket Grunt in Slowpoke Well. Also, in the Sinjoh Ruins; the beta screen shows the three circles on the ground being all the same color. They are all different in the final version. Two items go unused in HG/SS; the Photo Album and the SlowpokeTail. The Photo Album is embedded within the Player's PC in the final version and is not an item they'd be carrying around. The SlowpokeTail was made a Key Item in HG/SS if its hacked in (it was a regular item in Gen II). It has however, no purpose. The same debugging tools discussed from Platinum's Alpha and Beta Secrets remain in HG/SS. "A Battle Stadium with five different sets of rules to enjoy." "A mountain where something mysterious awaits you underfoot." Due to legal issues related with gambling, the interior design of both Goldenrod and Celadon Game Corners were completely overhauled in all non-Japanese releases of Pokémon HeartGold and SoulSilver. However, the original design is still present within the internal data of the localized releases; despite being severely limited, since most dialogue scripts were removed. (With the exception of the Coin purchase interface, which is still completely functional and translated) The slot machine interface pointers are redirected to the Voltorb Flip interface instead. Next time, we get to Generation V; with Pokemon Black and White Alpha and Beta Secrets. It's been a LONG time coming; but it's time for the next chapter in the Pokemon Alpha and Beta secrets. This time; it's on Pokemon Black and White. We start with a beta sprite of Tepig from when you pick your starter. Tepig was the only one that had its sprite changed. Alterations were made to Hilbert, Cheren and Bianca in their VS Trainer sprites. Hilbert had a huge overhaul on his sprite, Cheren's eyes were simply altered. Bianca's VS Trainer sprite originally lacker her Xtransciever. When Excadrill was released, it had its stomach stripes mirrored from what they then became. In the Dreamyard, the beta music playing would be a seasonal variant of the Route 4 theme. In the final product; the Dreamyard had one static track, that played regardless of the season. In the United Kingdom; GAME and Gamestation retailers had beta box art that used the beta regional name of Alleos instead of Unova. This was also at pre-release and post-release demo events in the UK. Castelia City underwent at least 6 different aesthetic and graphical changes before the final release. Pre-release screenshots of Chargestone Cave showed the rocks lying around were of a different shape and color, and also had a slightly duller glow in the beta. When the Player was to buy items in the Mart, the screen would rotate. Also, in the Dream World there were early videos showing a wild Pikachu being befriended. Pikachu were also to be encountered in Entree Forest, as well as in the game itself. In the final version, Pikachu was unobtainable; and could only be obtained post-game through the Poke Transfer from a Gen IV game. Since Black and White were built off a modified Gen IV engine, all of the items that existed in Gen IV, also exist here. The only items missing were HM07 (Waterfall) and HM08 (Dive); which are now blank, question mark (?) items. Also the unobtainable item; the God Stone is found in the files. This item has no programmed use, and its original, obtainable location was not known. In the P2 Laboratory, if the Trainer used a walk through walls cheat, and made their way down; they'd find an untextured room with a few tables in it. There are also a few unused text strings referring to weather conditions. Most notably related to the Fog condition. Fog was on the overworld in Route 15, but the Fog was purely cosmetic. "Fog crept up as thick as soup!" It is to be known that these unused weather text strings also exist in Pokemon Black and White 2; and go unused in there too. Next time; we will look at the Alpha and Beta secrets of Pokemon Black and White 2. Did some minor work; fixing some images (changing all the dead images), and adding some more information. Black and White 2 are still next up in the Alpha & Beta secrets. "There are also leftover debugging tools within Platnium's files; like "Sound Test" and an option to modify the in-game clock." There was a sound test in Platinum? Whoa. I would kill to have a sound test in a Pokémon game that is accessible normally. Why hasn't Gamefreak started doing that? Also, Castelia City went through six **or more** revisions? Man. I should have figured. It was big and was bound to take a lot of work. (03-12-2017, 01:51 PM)FireLeo Wrote: "There are also leftover debugging tools within Platnium's files; like "Sound Test" and an option to modify the in-game clock." *Stickied* because this is such an interesting and great topic to read. Okay, it's time for Black and White 2 Alpha and Beta Secrets. These two sprites are shiny forms of PokeStar Studio opponents. Despite in the final release of the games; shiny forms were not able to be found there. The sprite images of every Key Item from Gen III up until now exist in Black and White 2; even for items like the Fame Checker. Key Item data for every Key Item from Diamond/Pearl onwards also exists. Using the Memory Link feature; you were able to communicate with a game file of Black/White. However, unused text strings for the Pokemon World Tournament (PWT) have Hilbert/Hilda as possible opponents. Their strings are after Volkner and before the text strings for the Driftveil Tournament opponents. Unlike the Memory Link; their names were always going to be Hilbert/Hilda. Announcer's introduction: "Meet Hilbert/Hilda, the Trainer some claim to be the strongest of all!" Before battle (1st round): "Everything can be understood through Pokémon battles! Let's go!" Before battle (2nd round): "Words are the source of all misunderstanding! Everything can be understood through Pokémon battles! Let's go!" Before battle (Final round): "You communicate with Pokémon using feelings, not words! Everything can be understood through Pokémon battles! Let's go!" If the player is defeated: "I just lucked into winning... Isn't that how it felt?" After being defeated: "Make your dreams come true! Someone once encouraged me to do that. Even now, I'm continuing my journey to realize those dreams." After winning: "I'll leave you with words someone told me once. Dream your dream!" The unused weather text strings that I discussed from the Black and White beta exist here as well. There are a lot of unused Trainer Classes; although these all pretty much revolve around the PokeStar Studios. There are a cluster of unused text strings when talking to your Mother using the Extransceiver in specific places in Unova. Several locations have responses programmed for them when the player's mom is asked about the following locations over the Xtransceiver, but cannot actually be selected because the Xtransceiver is not usable in those locations. Additionally, some of the duplicate locations used in the Entralink and Victory Road in Black and White have different responses programmed than the normally accessible locations. Route 10: "Ah, I liked Route 10. There was something lyrical about it..."
Royal Unova: "The Royal Unova? A cruise ship from Castelia! You're getting pretty fancy! So, which is it going to be? Are you going to have fun battling... or enjoy the sights?" Battle Subway: "Battle Subway! You sure like challenges. Keeping a winning streak going is really hard. But the knowledge and experience you gain from battle will make you stronger!" Entralink: "Entralink? I don't know about that... Is there a place like that in the Unova region?" Trial Chamber: "The Trial Chamber? A Trainer might have told me about it a long time ago. Was it the little room on Victory Road?" Entree Forest: "Entree Forest? I'm not familiar with it, I'm afraid. You say there's a place like that in the Unova region?" Plasma Frigate: "What? The Plasma Frigate? Never heard of it. Should I go have a look and see what it's like?" Route 5: "I used to slip out of the Pokémon Center from time to time to watch the performers on Route 5. Isn't there a girl there who buys items?" Undella Town: "Undella Town, Undella Town. A very rich family used to live there, but it looks like everyone moved. Now there are fewer manors there. It's a little sad." In the games; Route 10 suffered a sort of collapse, making the Route impassable. However, next to everything exists for this area. The only thing that doesn't exist is wild Pokemon encounters. The game still manages to identify this area as "Route 10", but the game can't point to this area. Because, it doesn't technically exist anymore. Tune in next time for Pokemon Alpha and Beta Secrets; where we look at the first fully 3-D core series Pokemon games, being Pokemon X & Y.
I WAS going to talk about the alpha and beta of Pokemon X & Y, but we got quite a bombshell dropped on us over the past few days. The beta of Pokemon Gold/Silver, which was originally shown at Spaceworld 1997 dropped on to the Internet, and it is truly a treasure trove. This is just a snippet of some of the beta sprite designs. We can see the unused Fire starter (Honoguma) and Water starters (Kurusu) here, as well as a beta Bayleef. Perhaps Kurusu inspired Popplio in Sun & Moon? And baby Pokemon; me oh my, we got a bunch of them! Such Pokemon like Meowth, Vulpix, Doduo got baby Pokemon out of nowhere, and only in this demo. We also get to see early designs for Pokemon that would be released in later Generations; both Tangela and Lickitung got beta evolutions. Also, Ditto could've seen an evolution. It would've been triggered via the Metal Coat; unsure if it would've been a trade evolution like the others, or the possibility of a "contact" evolution, like the item was a stone. Also, that face it makes; is the face of someone stuck in eternal pain and purgatory. This is the beta map for G/S. As you can see, it's a radically different design that what we got. The arrow to the town I'm pointing to was Silent Hills, or beta New Bark Town. 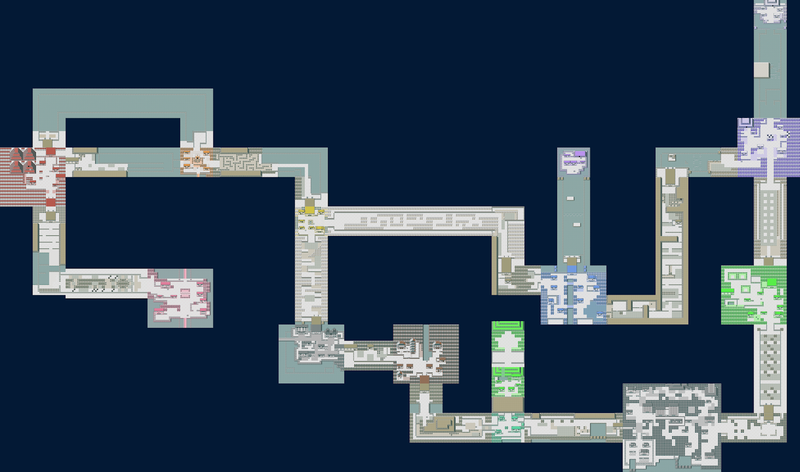 Johto is rather flat, the map is rather small, and somewhat confusing if you don't really know the map. I can assume we all would've struggled in some way, shape or form if we had this Johto to play through in the late 90s/early 2000s, especially with the Internet in its infancy in terms of everyone getting access to it. Start where I point to, going left leads you into Johto, right into Kanto. There is a massively helpful Google Doc data dump that has all the information you could ever need on beta G/S. I won't really spoil anything else; I want you to find out for yourself! 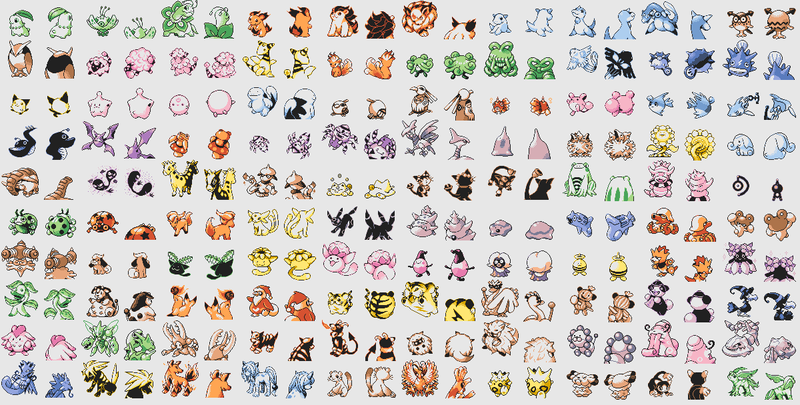 Here is a sprite sheet, in color, of the beta Pokemon Gold/Silver sprites.